Ready to get started on your kitchen remodeling project? The kitchen is the busiest room in the house, and renovating it is no small job. At Kenwood Kitchens, we offer a comprehensive kitchen renovation process to our clients in order to make the transition as easy as possible. 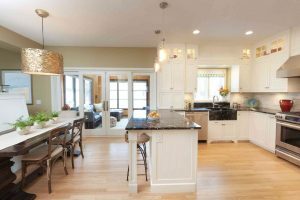 Here are a few ways that you can prepare for a successful and enjoyable remodeling experience. The first step towards creating your dream kitchen is to evaluate your current one. What about it are you happy with and what would you like to change? Is there an area you would like to see altered in order to create a more functional space? For example, are you taking too many steps when trying to prepare meals? Your kitchen designer can help organize the space so that the range, refrigerator, cooking utensils, spices, pots, and pans are in close proximity to each other with ample counter space. Likewise, the sink, dishwasher, and disposal should be placed together for easy clean-up. How is the majority of your time in the kitchen spent? If you spend most of your time cooking or preparing meals then your remodeling project should be focused towards making your “Top Chef” experience more functional (see above). If you do more entertaining with friends and family instead of preparing gourmet meals, you should make sure you have plenty of seating – perhaps a large island with sufficient space around it for your guest to hang out. While your kitchen remodel should increase the beauty of your home, it should also increase functionality no matter how you use the space. As one of the leading kitchen and bath dealers in Maryland, we’re confident we can provide you with the kitchen or bathroom of your dreams. Though we welcome any ideas you may have gathered from HGTV, magazines, Pinterest boards, etc., our showrooms are complete with full displays and many samples. Our creative designers will help pull all of your selections together for a stunning end result that you won’t get working with contractors who send you all over the place in search of materials. This entry was posted on Friday, June 9th, 2017 at 12:56 pm. Both comments and pings are currently closed.